Food lover finds show up in the most unexpected places. 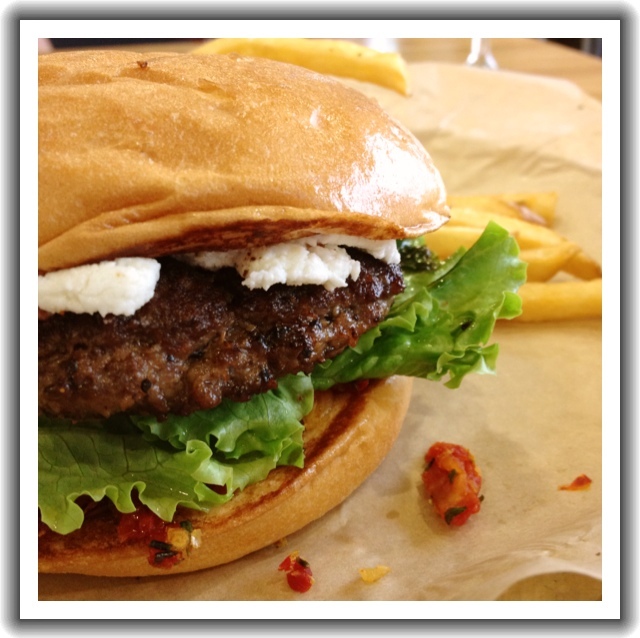 Evidence: local family-owned and community-focused All Star Burger in the Hill Country Galleria offers inventive burgers sourced from local farmers and markets. Further evidence: the Visionary, a rich Angus burger complimented with tart goat cheese, slightly sweet roasted garlic and sun-dried tomatoes, and woody rosemary. The crisp lettuce grounds it all with a bit of crunch and freshness. You can even go skinny style and swap the bun for a lettuce wrap. Pair with sweet potato fries and their secret, smoky dipping sauce. And don’t forget a glass of wine, poured yourself on the honor system, because that’s just how they roll at All Star. Hint: goat cheese not your style? Try the BD Street for a blue cheese-stuffed, bacon-topped not-to-be-missed taste experience. Your posts are making me miss Austin all over again… There’s still so much out there to do, see, and of course, eat!